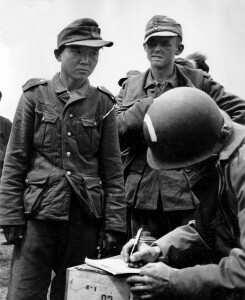 Yang Kyoungjong captured at Normandy. During the D-Day landings in 1944, American paratroopers captured an Asian man in Wehrmacht uniform. This man was Yang Kyoungjong, a Korean who had the misfortune of being conscripted by the Japanese (Korea was a Japanese colony at the time), captured and then pressed into service by the Soviets, and captured and pressed into service again by the Germans. Seventy years later, Yang’s unfortunate — but highly intriguing — story became the inspiration for a 2011 South Korean film titled My Way. My Way is only loosely based on Yang’s experience; its main character is named Kim Jun-shik. The movie starts in Kim’s childhood, during which he, his sister, and his father live with and serve a prominent Japanese family in Seoul. Jun-shik becomes acquainted with the family’s young son, Hasegawa Tatsuo, as both of them enjoy running and become racing buddies. However, when a Korean independence activist assassinates Tatsuo’s grandfather, he becomes an ardent Japanese nationalist and Jun-shik’s family is banished onto the streets. Several years later, Jun-shik and Tatsuo bump into each other again while competing to represent Japan as runners in the Olympics. During tryouts, Jun-shik finishes before Tatsuo but is denied recognition because he is Korean — triggering a riot. In the riot’s aftermath, Jun-shik and his fellow Koreans are sentenced to service in the Imperial Japanese Army. In Manchuria, Jun-shik and Tatsuo meet yet again when Tatsuo is brought in to replace the old unit commander after a defeat. With his nationalistic sentiments, Tatsuo introduces a strict reign and assigns Koreans to a special suicide unit, threatening to shoot anyone who disobeys orders or retreats in battle. When the Soviets surprise-attack, both Jun-shik and Tatsuo find themselves POWs — and proceed to endure the same repeated conscriptions that Yang Kyoungjong did in real life. The introduction of a Japanese character alongside the Korean lead is a blatantly practical choice. It helps My Way manufacture dramatic tension and makes the story more accessible to those who may not be familiar with the intricacies of Soviet/German conscription practices during WWII. While the real-life story of Yang Kyoungjong is a product of total war’s moral shades of gray, My Way rests upon more black and white, emotionally intuitive concepts like the “brotherhood of war” and sports rivalries. This is a film clearly intended to be a mass-market blockbuster (also evidenced by its $24 million USD budget — one of the most expensive in Korean film history). Unsurprisingly, outside of its novel premise, My Way feels and looks like other war films that have come before it. Roughly put, it’s a mix between Taegukgi (one of Korea’s most popular films) and Enemy at the Gates (both have uncomfortable scenes of Soviet officers gunning down retreating soldiers). There are lots of big explosions, sweeping shots (of questionable necessity to the plot) across snowy mountains, a cameo by Chinese starlet Fan Bingbing, and other formulaic but entertaining pieces to a cinematic IKEA desk. My Way is action-packed and accessible, but not particularly novel in its telling of a highly unique premise. The experience of Yang Kyoungjong could’ve inspired a far more introspective and evocative film, but something was lost in translation between the past and profit-driven present. My Way (Korean:마이 웨이) — Directed by Kang Je-gyu. First released December 2011. Running time 1hr 59min. Starring Jang Dong-gun, Joe Odagiri, and Fan Bingbing. Like this film? Support the filmmakers and Cinema Escapist by buying My Way with our Amazon affiliate link — there’s no extra cost for you. Thank you for your support! Wow, I can’t believe they made a movie out of this story. Weird to see WWII from so many sides. but pretty cool too.